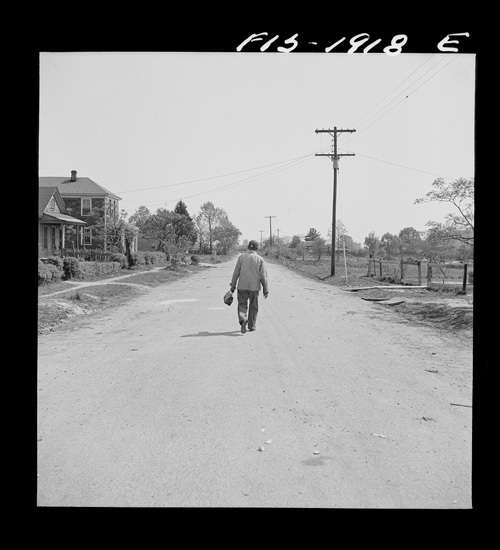 Back in the day lunches were carried in not by means of carry out. 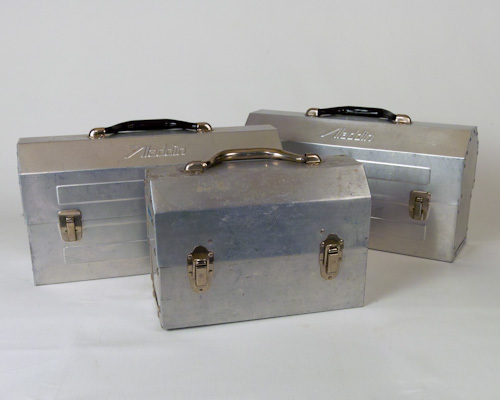 Metal lunch boxes were the mode of transport built to last and protect sandwiches from conditions on the docks, in the mines, or factory lines. Conformity was the norm, shiny aluminum or, more often for office workers than factory workers-black. 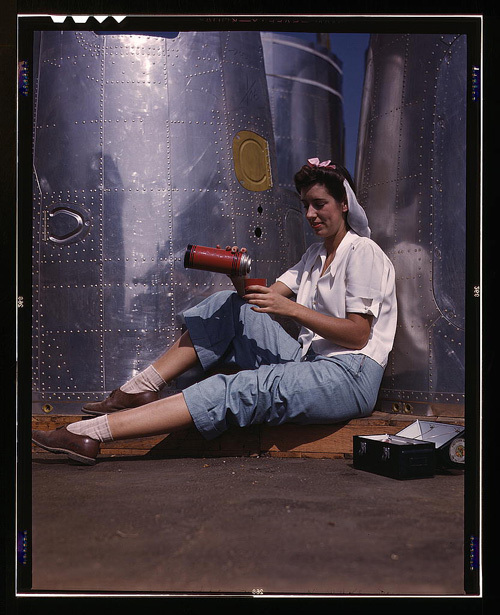 While some of the earlier lunch boxes resembled metal picnic boxes with two pivoting handles, many lunch boxes were the result of recycling or up-cycling with use of cookie and tobacco tins. “Make good money $5 a day …” a real working man’s or woman’s lunch boxes from the 1920s to the 1960s is considered a collectible. In the 1970s metal lunch boxes were virtually stamped out. 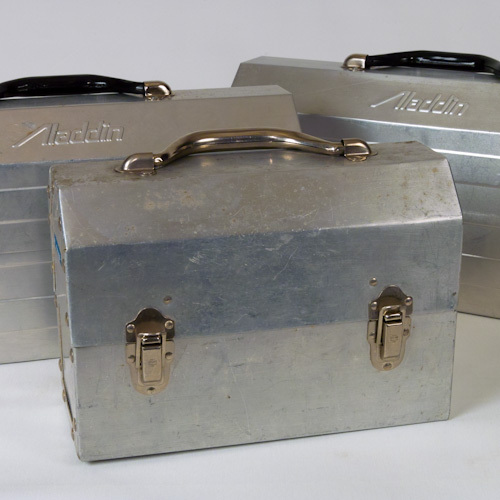 Two of our Aladdin lunch boxes are stamped “MADE IN CANADA.” Originally purchased through an estate sale they appear not to have been used as weapons as was feared by mothers in the state of Florida in the 70s who lobbied to have metal lunch boxes banned. The Aladdin logo is embossed on the lid. The handles are metal with rubberized coating. Their aluminum piano hinges are riveted, connecting top and bottom. There are also hinged thermos holder inside. The hinged closures are in perfect condition securing all contents. The smaller vintage lunch box has the makings of the perfect lunch mate, and it was, for the original owner R. Fries. Made in the USA by Excelsior in Stamford, Connecticut, it shows the patina of the 5 day a week use it no doubt experienced. Sheared and formed aluminum with half inch diameter aluminum rivets and packaged as a ruggedly handsome, green alternative to its colorful, squishy soft, fabric zipped up cousins. Like the Aladdin models, we purchased the Excelsior through an estate sale. Its riveted all aluminum design is a true statement of early industrial design. Excelsior is de-bossed in the buckle. Like the Aladdin boxes, inside it has a hinged thermos holder, outside secure hinged buckles as closures. These lunch boxes have a few minor dings, light pitting, and minor scratches, all indicative of light wear, all add to the vintage character. We have seen these polished to perfection, but prefer the authenticity resulting from past use. Durable, these boxes are ideal not only for the function for which they were designed – lunch boxes, but may be re-imagined as clever carry alls, or for decorative use as a storage containers in one’s studio or office. Art student? … perfect for your pastels. Gardener? … store and carry your pruners, dibber, trowel and seed packets. Photo stylist? … never misplace the tricks of your trade. 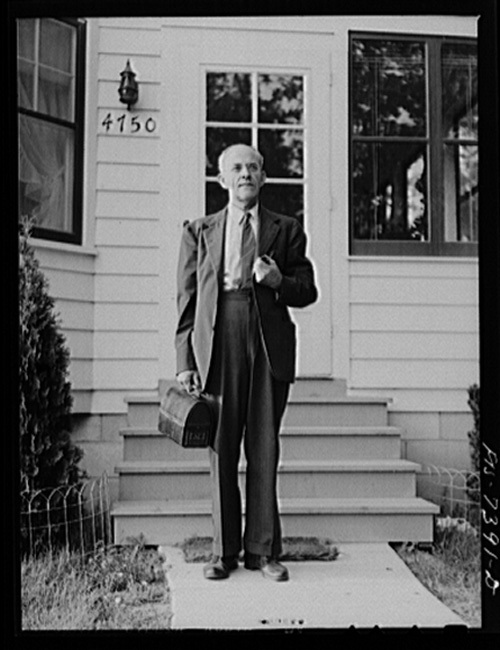 Karl Axel Westerberg leaving his home with his lunch box for a day’s work in the Ford Motor Company plant in Dearborn.